​Declining renewable energy prices are attracting growing interest from communities, companies, and their electricity providers. Rural Colorado is well positioned to benefit from the growth of renewable energy, with excellent wind energy resources in the Eastern Plains and solar resources throughout the state. Xcel Energy, the state’s largest electricity provider, recently received an unprecedented number of bids for new renewable energy projects, at prices so low they have attracted national attention. The utility aims to replace the power from two coal units with new wind, solar, battery, and natural gas projects, as part of a plan “that could lead to $2.5 billion in clean energy investments in rural Colorado,” with no additional cost to electricity consumers. These shifts in energy economics are creating new opportunities for communities throughout Colorado to invest in renewable energy projects in order to stabilize electricity rates, promote local economic development, and cut pollution. Several electric cooperatives are supporting these efforts, especially by pursuing solar power projects. The state of Colorado has committed to support this clean energy transition as well, with a July 2017 executive order directing state agencies to "work strategically with any interested electric utilities or cooperatives that, on a voluntary basis, would like to maximize its use of renewable energy." But a growing number of Colorado communities face additional challenges in their renewable energy efforts, simply because they are served by one of the many electric cooperatives that are restricted from pursuing local energy projects. There are 22 electric cooperatives that provide electricity to most of rural Colorado, and 18 of those co-ops buy electricity from Tri-State Generation and Transmission Association. Those 18 co-ops are currently limited to providing just 5% of their electricity needs from local renewable energy projects, and must purchase the rest from Tri-State. Out of Colorado’s 64 counties, 53 counties are served entirely or in part by co-ops that buy electricity from Tri-State. So most regions of the state – including regions with the best wind and solar resources – are impacted by Tri-State policies that limit local renewable energy projects. This report shows the growing interest in local renewable energy projects from electric cooperatives in Colorado that buy electricity from Tri-State, as well as a look at some of the Tri-State policies that are restricting or discouraging co-ops from pursuing local renewable energy projects. Information about planned renewable energy projects is primarily from the responses by co-op managers and staff to a survey conducted in December 2017 and January 2018 that sought information about renewable energy projects that co-ops were pursuing or had already completed. Information about existing renewable energy projects is from a variety of sources, including survey responses, a review of co-op websites and monthly board meeting minutes, the National Rural Electric Cooperative Association website, and filings with the Colorado Public Utilities Commission. The results of this research show that at least 13 of the 18 electric cooperatives in Colorado that buy electricity from Tri-State are pursuing renewable energy projects, or have already developed projects of at least 1 megawatt. Four co-ops have already reached the 5% limit, and are currently restricted from pursuing more local renewable energy projects. Four more co-ops are approaching the 5% limit, and so face limits on the size of any future projects. Another co-op was impacted by the 5% limit when it pursued a project in 2009, showing that this policy has impacted renewable energy development in the state for several years. 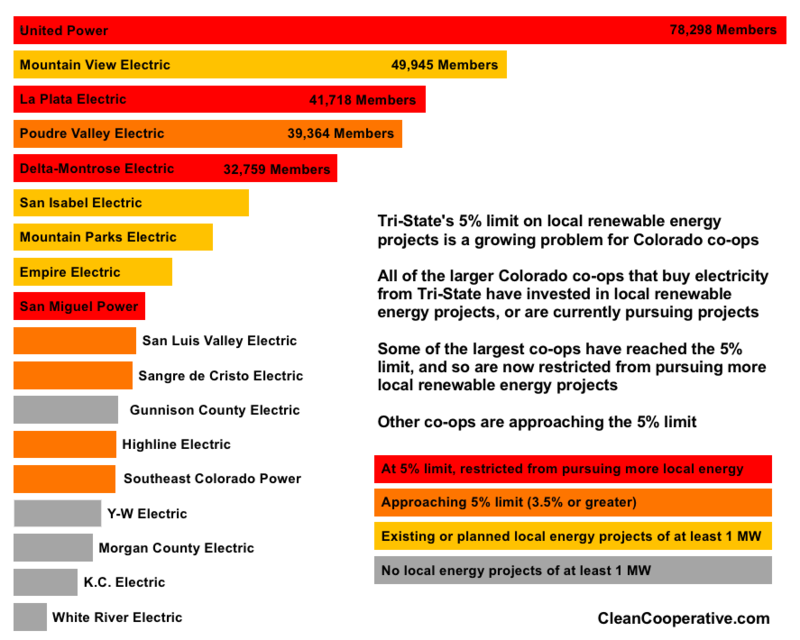 Correlating these results with the size of each co-op shows that Tri-State’s limits on local renewable development are impacting the largest co-ops, in terms of both membership and electricity sales. Three of the five largest co-ops that buy electricity from Tri-State have reached the 5% limit, and are responding with a variety of strategies to this limit on local energy projects. ​The widely varying size of each of the 43 co-ops that buy electricity from Tri-State also highlights a problem with Tri-State’s governance structure. While each co-op has one representative on the Tri-State board of directors, some co-ops serve many more members than others. As an example, three of the largest co-ops that have reached the 5% limit (United Power, La Plata Electric, and Delta Montrose Electric) serve a combined total of 152,775 members – one quarter of all members served by co-ops that buy electricity from Tri-State. Meanwhile, the 22 smallest co-ops serve a combined total of 103,863 members – yet representatives from those co-ops constitute a majority of the Tri-State board. From the perspective of co-op members, this is a major inequity in representation, because a small minority is able to impose policies that limit the local energy development choices of co-ops that serve hundreds of thousands of Coloradans. In addition to the 5% limit, a review of co-op board meeting minutes shows that other recent Tri-State policy changes have negatively impacted local renewable energy development in Colorado, even for co-ops that are not approaching the 5% limit. In May 2017, a Tri-State policy change reduced the savings that co-ops could expect from developing solar projects. Several co-ops discussed the negative impacts of this change at their monthly board meetings, even on projects that they were in the process of negotiating with developers. Another co-op canceled a planned solar project shortly after the policy change. Colorado co-op members, directors, and staff should proactively address the growing problem of Tri-State policies that limit local renewable energy development, with an eye toward cooperative principles of democratic member control, community concern, and autonomy and independence. Cooperation between Colorado co-op directors, staff, and members should be able to solve these problems, with mutual respect for each co-op’s local energy development choices. Tri-State directors and management should support these efforts and respect member co-ops’ independence and choices by eliminating its policies that limit local renewable energy development. Instead, Tri-State should partner with distribution cooperatives to maximize renewable energy development throughout its service territory, which has some of the best wind and solar resources in the nation. Tri-State has recently added new wind and solar generation, and states that "Renewable energy means a lot to us, our member systems and the communities we serve." Changing its policies to respect member co-ops' independence may be more complex, but it should be clear to Tri-State that restricting its largest member co-ops from pursuing local renewable energy projects is not a sustainable long-term strategy. Each of the 43 electric cooperatives that purchase electricity from Tri-State are required to purchase 95% of their electricity from Tri-State, under terms defined in their wholesale electric services contracts. This 5% limit on local energy development has been controversial in some communities for several years, and a few co-ops in Colorado and New Mexico have long challenged the restriction. In 2016, Kit Carson Electric Cooperative in Northern New Mexico ended its contract with Tri-State in part because it was seeking to pursue more local solar projects, but was restricted from doing so because it had reached the 5% limit. Without the 5% limit, Kit Carson is now building several solar projects throughout its service territory, as part of a plan to provide 100% solar energy for the co-op’s peak summer daytime demand. Now, co-ops accounting for a much larger share of Tri-State’s sales have reached the 5% limit, and are pursuing a variety of strategies in response. Four co-ops in Colorado that buy electricity from Tri-State have reached the 5% limit, and so are currently restricted from pursuing more local renewable energy projects. Those co-ops include three of the largest co-ops in Colorado, with far more members than most other co-ops that buy electricity from Tri-State. Delta-Montrose Electric has challenged the 5% limit for years, and has won Federal Energy Regulatory Commission (FERC) rulings upholding the applicability of the Public Utility Regulatory Policies Act (PURPA) in supporting the co-op's ability to pursue local renewable energy, despite the 5% limit. Tri-State has challenged those FERC rulings, so the final outcome is considered undecided until FERC rules on that challenge or declines to reconsider the issue, or Tri-State drops the challenge. In April 2017, the La Plata Electric board passed a resolution urging Tri-State to increase the 5% limit. La Plata Electric's general manager also presented a white paper, “The Case for increasing Distributed Generation per Tri-State Board Policy 115” to support that effort. Despite those appeals, the Tri-State board of directors voted to keep the 5% limit, the Durango Herald reported in August 2017. In October 2017, United Power announced plans for its first community battery project, a 4 megawatt / 16 MWh Tesla Powerpack that will be the largest battery in Colorado when it comes online in early 2018. These four electric cooperatives that are currently restricted from pursuing local energy projects include some of the largest co-ops that buy power from Tri-State, by both membership and electricity sales. United Power is by far the largest electric cooperative that purchases electricity from Tri-State, in terms of both membership (78,298 members) and electricity sales. Tri-State’s 2016 10-K notes that “United Power, Inc., comprised 14 percent of our Member revenue and 11.8 percent of our operating revenue in 2016.” La Plata Electric is the third largest by membership (41,718 members) and electricity sales, comprising 6% of Tri-State's electricity sales to member co-ops. Delta-Montrose is the fifth largest by membership (32,759 members), and ninth largest by electricity sales. Combined, United Power, La Plata Electric, Delta-Montrose Electric, and San Miguel Power accounted for 3,843,701 MWh in electricity sales in 2016, about one fourth of Tri-State’s 15,746,382 MWh total sales to member cooperatives in 2016, according to its 10-K.
United Power, La Plata Electric, Delta-Montrose Electric, and San Miguel Power provide electricity to a combined total of 166,114 co-op members, 27% of the 603,613 co-op members served by all co-ops that purchase electricity from Tri-State. Co-op membership is counted by electric meter, so a single membership often includes multiple people that live in one residence. That means that hundreds of thousands of Coloradans are served by electric cooperatives that are currently restricted from pursuing local renewable energy projects, simply because of Tri-State policies. ​In addition to the four Colorado co-ops that have already reached Tri-State’s 5% limit, four other co-ops are approaching the limit, and so face limits on the size of any future projects. Southeast Colorado Power is pursuing a 4 megawatt solar project that is expected to come online in March 2018. According to a representative’s response to the survey, that project will bring the cooperative close to the 5% limit, with room for about another 1.5 or 2 megawatts. Poudre Valley Electric has pursued several solar projects, and the co-op’s renewable energy projects provided around 3.5% of its annual sales in July 2017, according to a Poudre Valley Electric representative. Since then, the co-op has brought two more solar projects online, a 3.5 megawatt project and a 1.95 megawatt community solar project. Highline Electric is “currently looking into options to install a utility scale solar project,” according to a representative’s response to the survey. It also has a 4.5 megawatt waste heat recovery project, according to the National Rural Electric Cooperative Association (NRECA). Filings with the Colorado Public Utilities Commission show that Highline Electric generated 11,457 MWh in 2016, 3.5% of its total electric sales. Along with the co-ops that have reached the 5% limit, these four co-ops that are approaching the limit provide electricity to 238,582 co-op members in Colorado, 60% of the 397,836 co-op members in the state served by co-ops that buy electricity from Tri-State. ​The impacts of Tri-State’s limit on local energy development will continue to grow as more co-ops approach the 5% limit. Filings with the Colorado Public Utilities Commission show that San Isabel Electric’s wind power project provided 26,361 MWh in 2016, 3% of the co-op's total electricity sales. ​In 2017, several more co-ops in Colorado began pursuing solar power projects, attracted by prices that have declined well below the wholesale price of electricity provided by Tri-State. Otero County Electric in New Mexico is bringing a 3 megawatt solar project online in March 2018 that will sell electricity below 4.5 cents per kilowatt-hour, and a Rocky Mountain Institute review shows solar project bids at similar prices for Colorado co-ops. ​Outside expertise has also played a role in supporting smaller co-ops, which often don’t have staff dedicated to negotiating power generation projects. Sangre De Cristo Electric is working with the town of Buena Vista and the Colorado Department of Corrections to bring a 2 megawatt solar project online by the end of 2018. Mountain Parks Electric is working with Rocky Mountain Institute to pursue a 1 megawatt solar project. Along with existing hydroelectric power, the solar project will bring the co-op's self-generation to about 2.4% of its annual sales. Mountain View Electric is also working with Rocky Mountain Institute to pursue a solar project that "should achieve savings of $130,000 per year for a twenty year project,” according to the co-op’s September 2017 board meeting minutes. Empire Electric is evaluating two solar projects “that will be in the 1 MW generation range” according to an Empire Electric representative’s response to the survey. In sum, at least 13 of the 18 Colorado co-ops that purchase electricity from Tri-State are pursuing local renewable energy projects of at least 1 megawatt, or have already completed projects. Four of those co-ops are currently restricted from pursuing more local energy projects because of Tri-State’s 5% limit, while another was impacted by that limit in the past. At least four more co-ops are currently generating over 3.5% of their electricity needs or soon will be, and so face limits on the size of any future projects they can pursue. Notably, the Colorado co-ops pursuing local renewable energy projects include all ten of the largest co-ops in Colorado that buy electricity from Tri-State. The 13 co-ops pursuing local renewable energy projects in Colorado provide electricity to 360,507 co-op members, 60% of all co-op members served by co-ops that buy electricity from Tri-State. Those 13 co-ops also accounted for 8,179,107 MWh in electricity sales in 2016, 52% of Tri-State’s 15,746,382 MWh total sales to member cooperatives in 2016. 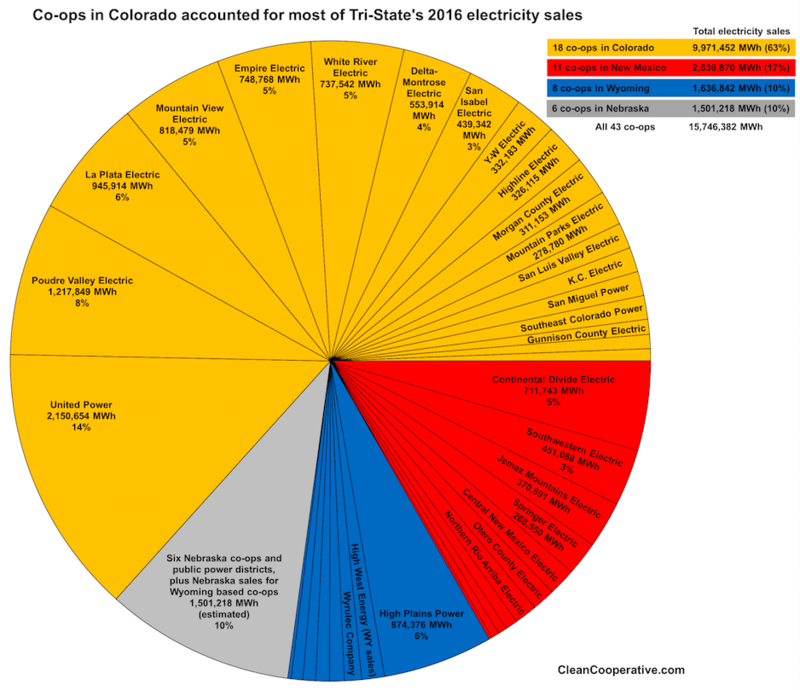 Co-ops in Colorado that buy electricity from Tri-State vary widely in size, and this variation is even more pronounced compared to co-ops in other states. Tri-State sells electricity to 18 co-op in Colorado, 11 co-ops in New Mexico, eight co-ops in Wyoming, and six co-ops and public power districts in Nebraska. The widely varying size of each of the 43 co-ops that buy electricity from Tri-State highlights a problem with Tri-State’s governance structure. ​While each co-op has one representative on the Tri-State board of directors, some co-ops serve many more members than others. For example, three of the largest co-ops that have reached the 5% limit (United Power, La Plata Electric, and Delta Montrose Electric) serve a combined total of 152,775 members – one quarter of all members served by co-ops that buy electricity from Tri-State. Meanwhile, the 22 smallest co-ops serve a combined total of 103,863 members – yet their representatives constitute a majority of the Tri-State board. ​From the perspective of co-op members, this is a major inequity in representation. The result of this problematic governance structure is that a small minority is able to impose policies that limit the local energy development choices of co-ops that serve hundreds of thousands of Coloradans. 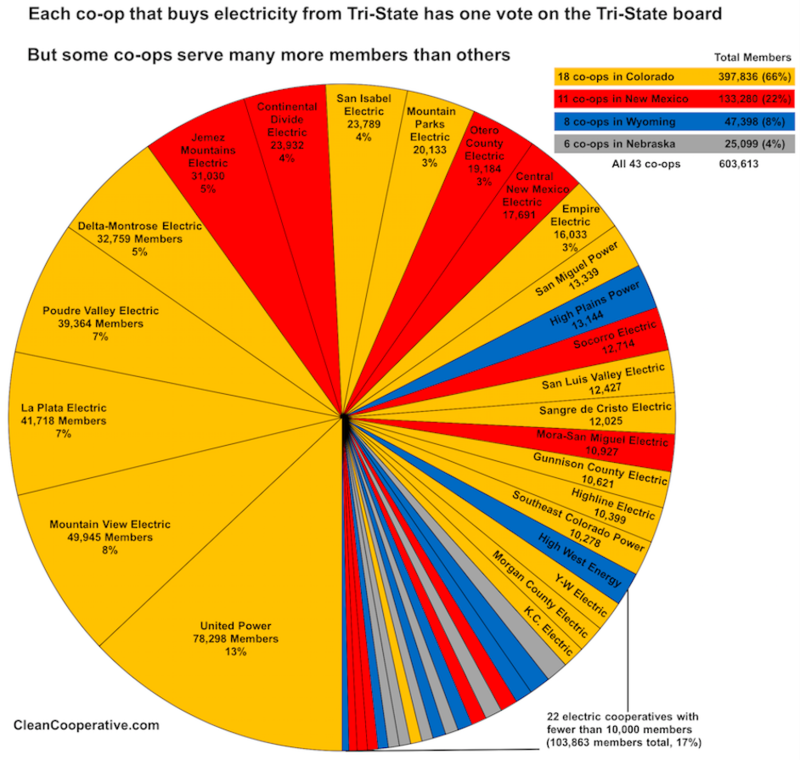 The chart below shows the relative membership size of the 43 co-ops that buy electricity from Tri-State, with colors showing the state in which each co-op is located. Co-ops in Colorado account for two thirds of all the members served by those 43 co-ops. Membership data for each co-op are from the National Rural Electric Association (NRECA) Member Directory, accessed January 20, 2018. The full data set is available in Appendix 1. ​In addition to the 5% limit, other recent Tri-State policy changes have discouraged local renewable energy projects, and even disrupted projects that co-ops were negotiating with developers. In May 2017, Tri-State revised its Member System Distributed Generation policy (Policy 115) in a way that reduced the savings that co-ops could expect from pursuing local solar power projects. This policy change was enacted while several Colorado co-ops were negotiating prices and details with solar power developers. During their May board meetings, at least three Colorado co-ops discussed the negative impact of the policy change on the economics of the solar projects they were pursuing, and one co-op canceled its solar project. ​​Mountain Parks Electric’s staff and board also discussed during the co-op's May meeting how Tri-State’s changes to Policy 115 “will reduce the savings to MPEI” for the solar project it is pursuing. Also during its May board meeting, ​KC Electric stopped pursuing a community solar project, following an update from its general manager about the most recent Tri-State board meeting. ​Also in March, Morgan County Electric stopped pursuing a solar project. Colorado co-op members, directors, and staff should proactively address the growing problem of Tri-State policies that limit local renewable energy development, with an eye toward cooperative principles and values. "Cooperatives around the world operate according to the same set of core principles and values," as the National Rural Electric Association explains, and "These principles are a key reason that America’s electric cooperatives operate differently from other electric utilities, putting the needs of their members first." Principle two emphasizes that "Cooperatives are democratic organizations controlled by their members," while principle seven notes that "Cooperatives work for the sustainable development of their communities through policies supported by the membership." "Cooperatives are autonomous, self-help organizations controlled by their members. If they enter into agreements with other organizations, including governments, or raise capital from external sources, they do so on terms that ensure democratic control as well as their unique identity." Tri-State policies that restrict co-ops from pursuing local renewable energy development are inconsistent with cooperative principles of autonomy and independence, democratic member control, and community concern. These policies are uncooperative, and should be eliminated. 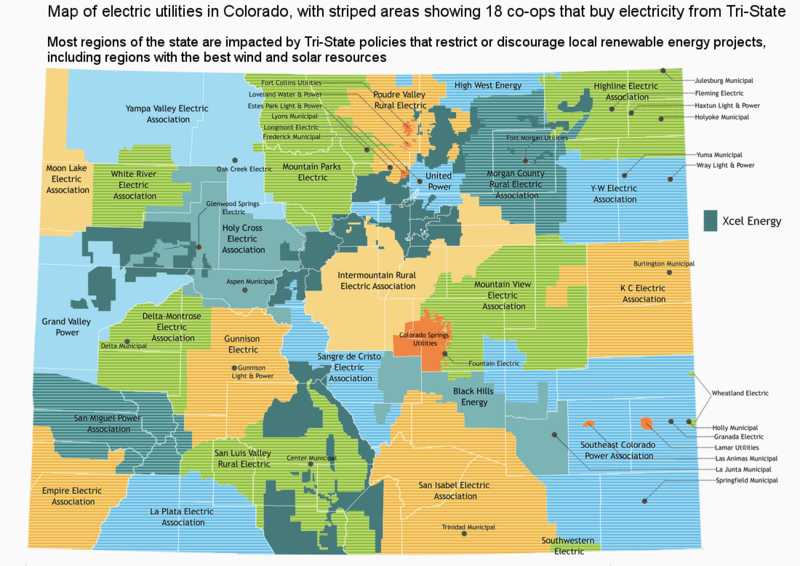 Colorado co-ops should take the lead in addressing these problems, because they represent the majority of Tri-State's electricity sales and co-op membership, and are the most impacted by Tri-State policies. Cooperation between Colorado co-op directors, staff, and members should be able to solve these problems, with mutual respect for each co-op’s local energy development choices. Tri-State directors and staff should support these efforts and respect member co-ops’ independence and choices by eliminating its policies that restrict or discourage local renewable energy development. Instead, Tri-State should partner with distribution cooperatives to maximize renewable energy development throughout its service territory, which has some of the best wind and solar resources in the nation. Tri-State has recently added new wind and solar generation to its portfolio, and states that "Renewable energy means a lot to us, our member systems and the communities we serve." Changing its policies to respect member co-ops' independence may be more complex, but it should be clear to Tri-State that restricting its largest member co-ops from pursuing local renewable energy projects is not a sustainable long-term strategy. The chart above shows the relative size of the 43 co-ops that buy electricity from Tri-State, in terms of 2016 electricity sales. Co-ops are organized and color-coded to show the state in which each co-op is located. Electricity sales data for each co-op is from filings with the Colorado Public Utilities Commission, New Mexico Public Regulatory Commission, and Wyoming Public Service Commission. The full data set and links to source documents are available in Appendix 2. Membership data for each co-op is from the National Rural Electric Association (NRECA) Member Directory, accessed January 20, 2018. Electricity sales data for co-ops in Colorado are from filings with the Colorado Public Utilities Commission to show compliance with the state renewable portfolio standard. Electricity sales data for co-ops in New Mexico and Wyoming are from annual reports filed with the New Mexico Public Regulation Commission and Wyoming Public Service Commission - click on each co-op to access its annual report. Note: Electricity sales data for co-ops and public power districts in Nebraska are estimated by subtracting the electricity sales to co-ops in Colorado, New Mexico, and Wyoming from Tri-State's total 2016 electricity sales, which is reported in its 10-K filing. Three co-ops based in Wyoming (Wyrulec, Niobrara, and High West) also serve members in Nebraska, and those electricity sales in Nebraska are included in the estimate of Nebraska co-op electricity sales. High West Energy also serves members in Colorado, and those electricity sales are accounted for separately in this appendix and the chart. A few other co-ops also provide relatively small amounts of electricity to members in neighboring states, including Big Horn Electric (Montana), Empire Electric (Utah), and Columbus Electric (Arizona). Adams, Alamosa, Archuleta, Baca, Bent, Boulder, Chaffee, Cheyenne, Costilla, Crowley, Custer, Delta, Dolores, Douglas, El Paso, Elbert, Fremont, Gilpin, Grand, Gunnison, Hinsdale, Huerfano, Jackson, Jefferson, Kiowa, Kit Carson, La Plata, Lake, Larimer, Las Animas, Lincoln, Logan, Mineral, Moffat, Montezuma, Montrose, Morgan, Otero, Ouray, Phillips, Pitkin, Prowers, Pueblo, Rio Blanco, Rio Grande, Saguache, San Juan, San Miguel, Sedwick, Summit, Washington, Weld, Yuma.